I’m half-way through reading a book entitled “The Willpower Instinct” by Kelly McGonigal, Ph.D. Pretty much everything she says about willpower is right in harmony of Natural Hygiene principles. 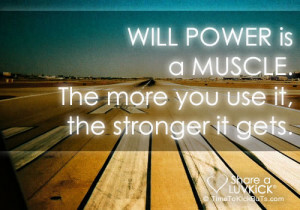 Basically, she is saying that Willpower is a muscle that can be strengthened. And some of the ways to strengthen it are meditation and exercise. Both cause the mind to have to stay focused and avoid distractions which are what temptations are to our goals we’ve set for ourselves. And while me may not meditate perfectly, that’s not the goal; the goal is to strengthen that focus muscle, the more “monkey mind” thoughts the better, and thus we build up our resistance to tempting stimuli and thoughts. She also says that certain parts of our brains focus on willpower and that low-blood sugar and tiredness can cause our willpower to drop (which is exactly what natural hygiene teaches–energy is key). That’s why it is so crucial to eat a healthy, high-fiber, high natural fruit sugar diet (she even mentions the benefits of a plant-based diet) and to get plenty of sleep. She said that willpower can be “spent” just like a muscle can be spent after exercise, and needs to be replenished via sleep. Which is why we often cheat on our diets in the evening after a long day at work. Stress diminishes will power as well since self-control is often used up during these moments and the part of our brains dealing with stress actually competes with the part that deals with willpower. So it’s not that you are weak and have no willpower, it’s that you are tired and stressed. The trick is to practice deep breathing exercises to calm yourself down and to take naps so that you can stay focused and on track. And, to not overschedule yourself during the day and to set up your day as to minimize stress as much as possible such s leaving early to avoid rushing and being late and schedule breaks into your day. I highly recommend the book, as it makes for a fascinating read. It will help you to incorporate the non-food principles of natural hygiene by helping you to see the science behind WHY they work. It will also give yourself a dose of gentle understanding of why you are not perfect; you are not weak you just don’t know how to support your physiology just yet. I especially thought the idea that exercise increases willpower fascinating. She begins the book with a story about a woman who was severely overweight, smoked, was heavily in debt and could not hold down a job. She is now a marathon runner, has lost all the weight, quit smoking and paid off her bills and has had the same job for a few years now. She completely changed her life and the neural circuits in her brain by focusing on one thing (running) and it gave her the self-discipline to do all the other things. The book says self-knowledge is the key to self-discipline and by becoming aware of why we fail, we can strengthen those areas and develop strategies for becoming successful. We live in a stress-filled, sleep-deprived, instant-gratification society and we are swimming against the grain when we learn these techniques that really can be developed by anybody. If you want to live the life you’ve always wanted, give yourself some meditation time, embark on an exercise program and get some sleep!